We are incredibly excited to be welcoming JP Delaney and Cara Hunter to The Marlow Bookshop to discuss their work as crime writers. JP Delaney is the best-selling author of psychological suspense novels The Girl Before and Believe Me. Both have been huge critical and commercial successes, with The Girl Before being sold in 441 countries alongside being developed as a film by Academy-Award winner Ron Howard. He lives in Oxford. 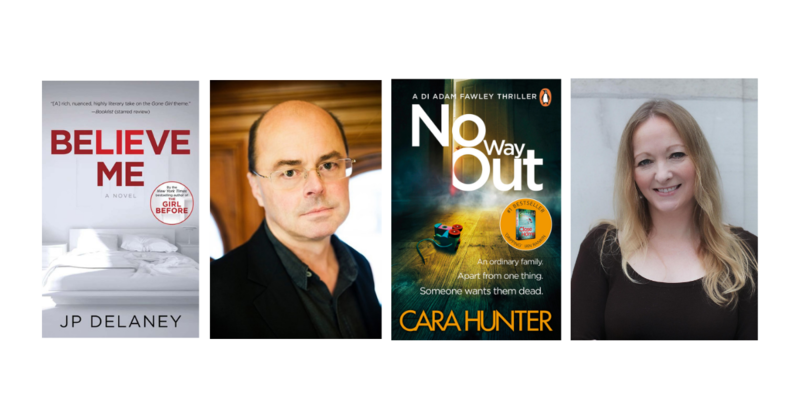 Cara Hunter is the author of the Sunday Times bestselling crime novels Close to Home and In the Dark, featuring DI Adam Fawley and his Oxford-based police team. Close to Home was a Richard and Judy Book Club pick, and Cara’s novels have sold more than half a million copies worldwide. Her third novel, No Way Out, is published on 18th April 2019. She lives in Oxford, on a street not unlike those featured in her books. Tickets cost £5 and are available to purchase in the shop, or you can telephone us on 01628 473 240. All tickets include a glass of wine or a soft drink, and 20% off copies of books written by JP Delaney and Cara Hunter.